What does it mean when this phrase becomes more than just a militant slogan of the radical left, becomes an existential question for a whole society? The post-referendum situation is characterised by two, almost antagonistic points of departure. On the one hand, there is Sunday’s overwhelming OXI (“No”), a powerful articulation against austerity, false compromises, old elites; a rejection even stronger than left optimists dared to hope for. On the other, there is also the drama of closed banks and the threat of state bankruptcy. This is no abstract or theoretical matter. It’s a reality that is close to the people, to everyone and everything: What if the government can no longer pay out wages? What if even the meager 60 euros per day can no longer be withdrawn from ATMs? The Greek people said NO to the dictatorship of the fiscal order and gave new energy to their government’s mandate to proceed in the chosen direction. The Greek government provoked a political earthquake – and seems to be surprised by the strength of this disruption. Many analysts argued that the OXI campaign was a smart move on behalf of the left party to resign from office in a dignified manner, without breaking their own vows and promises. The majority of political activists expected a close result. What we now face is an eventful situation – unexpected and open for interpretation and explanation. Yes and no. No, because the government remains vulnerable in a double sense. There are both the coming negotiations regarding future memoranda, and there is the question of peoples’ everyday lives, of ensuring survival even over the next days. For both of these matters, the government will provisionally need the European elites. However, people have proven that they can lose fear, and refusal has been strengthened with a plebiscitary mandate. The people are willing to take a risk and fight. But will they be able to sustain the conditions of the struggle? 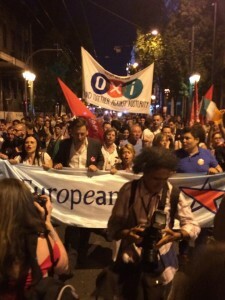 Can the single OXI, which was preceded by a whole cycle of social movement, from the occupation of Syntagma Square in 2011 to the electoral victory of Syriza at the beginning of this year, be transformed into social rupture – a rupture that must be more powerful than, and that must by far outnumber even the highest count of activists one could expect? And does the will to No already mean potential for social transformation? Against this backdrop, even an agreement in Brussels would be something other than the bad compromise many correctly feared over the last month: with a government that operates in part like an institutional insurrection and has survived an attempted coup is able to unite successfully against the European Imperium that very openly wants to get rid of it – and it has been able to do this within European territory. Does the meaning of a potential next agreement therefore change if it is clear that the agreement only serves to stabilize a new offensive? Might it be that the referendum has changed the political configuration in this manner? And will the institutional agreement lose its great symbolic meaning, seeing as, in the end, the political process of the referendum had a certain rupture as its precondition? These are no simple questions, and we should beware our radical romanticisms, without being pragmatic in the worst sense. At the very least, we perceive, even apart from Syriza, a decline in the symbolic meaning of possible agreements in Brussels. With the referendum, the Syriza government transformed an electoral promise into a real and definitive fact: the government is not capable of changing the situation for the people through the implementation of “good politics,” but rather remains, forcedly, a government of protest. It embodies the promise of the struggles and is simultaneously their institutional representation. The hundreds of thousands at Syntagma Square in the days before the referendum signaled but one clear message: we accept the declaration of war from the European apparatuses, and we are even willing to carry the burden of our government’s inner-institutional resistance, which could ultimately include crushing defeat. The government thus secured democratic support for its path of resistance. And the people did not succumb to a fear of the terror of closed banks. The Greek establishment was hit hard on Sunday, but perhaps even more important than the 61% is the popular movement that became manifest in the process. Syriza actually was able to mobilize far beyond its own electorate, to reach people long said to have lost any connection to politics. This was only possible because the mobilization itself was much more than the party. The excluded, the poor, the invisible, the superfluous – they took the stage and showed their willingness to take on the uncertainty of OXI. The OXI showed class character, and this is not a leftist fantasy, but the prosaic language of statistics. The validity of theoretical arguments on what economic, political, and social consequences the threatening Grexit might impose must now be seen in light of a new index. If there can be no compromise between the “Institutions” and Greece, and if the only options available, rather, are surrender or rebellious rejection, then since Sunday social rebellion is once again a possibility. The government no longer needs to accept a deal at any price, because the people have agreed to back this path. The people have not only made clear that government should fight for the maximal possibility. More importantly, they insisted on defining their own limits. Yes, there comes a point at which hunger is more desirable than a rotten tomato. For the moment, people have conquered fear. OXI- No is a battle cry. But no is not yet an answer or collective vision for the otherwise that could come. This reality is observable in leftist discussions. Listening to the talk in Diktyo yesterday evening had the momentary impression of being part of a discussion on the eve of revolution. We witnessed the new search for answers of those who say: We won’t allow them to take away or change the meaning of our OXI. No one is waiting for an answer from the party. The post-referendum time is characterised by discussions within the movements and extra-parliamentary organisations. What is our next step? How do we use the strength and support manifested by the Greek society in the referendum? The potential rupture – and this is what most know and agree on – is not the idea of a deliberate Grexit, that is, the presumption of knowing a better alternative, or even a solution. The break is, for now, reflected in terms of assurance, of collectivism, and the willingness to continue to struggle: do we dare to go further and take on the risk? This is not about the radical left alone. It is about a radical step of society, a collective step, to be taken by all (or most all). It can therefore only be a movement in the making, a movement that can only make and constitute itself, step by step, by rejecting subordination in an ongoing process. The rebellious exodus is an exit from, but rather an entry into European Empire, whose ruling classes wanted to bring down the Greek government with an explicit regime change. No, Syriza will not do the European elites the favor of transforming itself into a collective rural commune, into a forced shadow economy of a socialist People’s Republic of Greece. It will not allow the political dynamite of the debt dictat that is on the table in Brussels to be transformed into the mercy of promised humanitarian aid for their suffering people; it will not allow Greece to be fully degenerated into a beggar. The European YES campaign showed everyone that the Europe of the EU is in its essence a parliament of capital, and that its democratic pathos rests on a lie: the only representation allowed is that which re-enforces existing configurations. But Syriza wants something that doesn’t exist at the moment. The message from Berlin and Brussels was clear. »Resistance will worsen your situation.« Now it is becoming more clear than ever: the Empire can’t stand that the demos reclaiming its voice; it can’t allow the demos to move to the left. Oxi is the first example in just how far a crisis of representation can go. Greece has a left government, and it has a new system of political coordinates. The invisible and the excluded are the ones now speaking – on their own and through their government. Greece remains the laboratory of change. Did the »Great Refusal« (Marcuse) just begin? It’s up to us to europeanise the process. No matter what happens in Brussels, tomorrow, or the day after tomorrow. Oxi is bigger than every government.